Define Your Purpose with HOSA! These three words were the focus of over 1500 high school students at the Alabama State HOSA competition this year in Montgomery, AL. The Health Occupations Students of America are future health professionals that promote career opportunities in the health care industry and enhance the delivery of quality health care to all people. HOSA provides a unique program of leadership development, motivation, and recognition exclusively for students enrolled in health science education programs or have interests in pursuing careers in health professions. For the 2019 state competition, New Century’s chapter left a lasting impression in Montgomery. Meggie Mirabella placed 3rd in the state for Medical Spelling. Jackie Le and Meryem Budak placed 1st in their category of Poster Design. 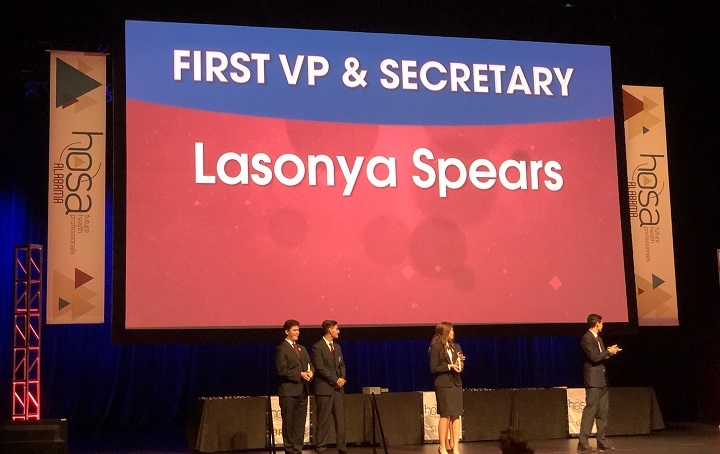 Lasonya Spears was selected out of dozens of candidates as the 2019 First Vice President, a State Officer position. Want to join New Century's HOSA? Read more on their club page.